FOR A CLUB to last one year is hard work. For a club to make it five years, it's a blessing. At 10 years, it's a blend of the aforementioned with a health dose of naked ambition and divine intervention. Jacek Rosicki and Ann Chin were onto something when they took over the brick building that housed Marsugi's and turned it into a sumptuous, three-story, fine dining/dancing entertainment complex. The key word was "lounge"as opposed to "club." And they are literally building upon that legacyan adjacent Annex is about four months from completion. I took a tour of the place last week, and it's an amazing spectacle with multilevel layout, separate kitchen, live-music stage and large bathrooms. And like Agenda, it's done with great attention to detail and amenities. 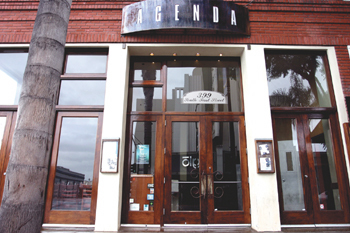 To celebrate its good fortune, Agenda hosts a 10-year anniversary party on Friday (Feb. 3). Enjoy $1 Grey Goose cocktails and champagne from 7 to 9pm with a spread of complimentary hors d'oeurves by chef Brad Kraten and live music by Times 4 and Modesto Briseno. Then at 10pm, DJs Rated R, Nappy, Brother Reese, J. Reese and Frank Morales take the party upstairs and into the night. Print up your own invite at www.agendalounge.com. From the December 7-13, 2005 issue of Metro, Silicon Valley's Weekly Newspaper.